The Tulip is the most popular bulb flower through the world. From the Middle East, where it grows naturally in countries like Iran, Afghanistan, Turkey, it was cultivated in the thirteenth century. Its name comes from the Turkish tulbend, turban, alluding to the shape of its flower. In Turkey it was vowed a real passion to the point of organizing lavish celebrations in his honor. At that time, all new varieties of tulips were conscientious yield invaluable listed and was a big business. This was the first to grow tulip bulbs and led the Netherlands in 1593, where he ertait director of the botanical garden in Leiden. 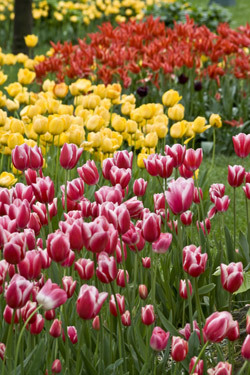 The Dutch government intervened the tulips in 1637 to stop any speculation and stabilize prices. The flower well acclimatized and found lovers. In the same family as lilies, tulips are dozens of species that come from temperate regions of Northern hemisphere, European or Asian. Easy to grow, it takes one cycle (dormancy) to fully develop. Today, millions of tulips are produced each year, much of which in the Netherlands, or sandy land-foragers are ideal for its cultivation.